So I have been feverishly working away on a Copyright article, but looking up from behind a starbucks table, I read with great interest Andrew’s post on the True History of the Kelly Gang. How true it is that outlaws capture our imagination and do shape the law. Eduardo Penalver and Sonia K. Katyal make this point brilliantly in their monograph Property Outlaws: How Squatters, Pirates and Protestors improve the law of property. But besides improving the law of ownership (which I agree it does), outlaws have different conceptual points of view for Americans. Outlaws tell us quite a bit about what our culture thinks about the law. 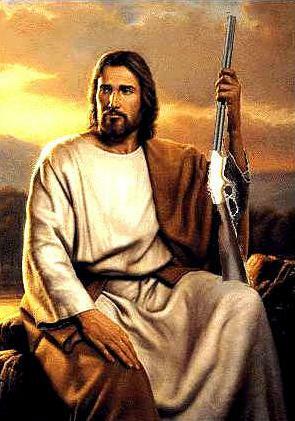 Two particularly telling outlaws are Billy the Kid and Jesus of Nazareth. In Stephen Tatum’s Inventing Billy the Kid, the author notes that the Kid’s elusive character may render his subject almost indiscernible for historians. Making the matter more difficult is the role Billy the Kid has played mirroring the American social dynamics of the time. For instance, Tatum shows that in the earliest representations of Billy the Kid, the American need for order amidst changing industrial upheaval was reflected in a “satanic” kid hunted down and killed by a valiant law man. When America was unhinged by Government scandals and economic collapse in the 1920’s and 1930’s, Billy the Kid was a defiant, individualist set amidst a tragic backdrop. And in the 1950’s, Billy the Kid was used to reflect upon the distemper of collective middle class conformity, placing him “at odds with a society not worth redeeming.” Indeed, Billy the Kid represents for America the perfectly ambiguous character — defiant when he has to be, oppressive when we need him to be, and all the while able to do so without necessarily articulating these traits. Unfortunately Tatum’s analysis ends in 1981, leaving out the classically 1980’s Bon Joviesque Billy the Kid in Young Guns and Young Guns II. (Bon Jovi did play a part in the sequel, besides penning the movie’s anthem in true hair band style — “Blaze of Glory”). Though I believe that the Young Guns movies perfectly identify the Kid with American Society — wandering, unsure of its identity, seeking to be known for something — (Just ask Gen-X or Baby Boom fellows what its like to follow the Greatest Generation…). In a fascinating way, Stephen Prothero makes the same points about Jesus of Nazareth in his book American Jesus: How the Son of Man became a Cultural Icon. From Thomas Jefferson’s wisdom-loving, parable saying nomadic purveyor of sayings, or its protestant’s desire to humanize Jesus by making him a moralist as opposed to a miracle worker following the Civil War, to the 1960’s free-love hippie LSD Jesus Christ Superstar, we seem to culturally appropriate narratives onto the life of Jesus which may or may not be accurate. But accuracy is not so much the point as identity. Indeed, as Prothero shows, Jesus has been reimaged by virtually everyone –” protestants, catholics, pentecostals, jews, muslims, Hindus, gays, blacks, feminists, hippies, atheists, rappers; while Christian insiders have had the authority to dictate that others interpret Jesus, they have not had the authority to dictate how these others would do so.” But more importantly, according to Prothero (and I agree) it probably does not matter that these images are accurate in regards to Jesus — a mystical figure who we will probably never truly know everything about– what’s more important is that they are accurate reflections of us. In the same way that The True History of the Kelly Gang forces us to ponder the role of historical narrative in our search for cultural meaning, Billy the Kid and Jesus of Nazareth forces us to ask central questions of believability — this time, the question is whether we can believe ourselves and the cultural narratives we are telling rather than whether we believe their stories that we tell. I have to respectfully but energetically dissent from the view that “accuracy” does not matter. Now while it is true that we may never possess the kind of historical knowledge about Jesus that would definitively rule out some of the crazier or unduly tendentious portraits, we can nonetheless rely on the Gospel narratives (as well as non-canonical sources) to reconstruct what Jesus had to say during his roughly three and half years of preaching, healing, exorcising, and so forth. A close study of those narratives should set the constraints upon any image or claims made about Jesus’s life and views. Of course the differences in reconstruction and interpretation often do speak volumes about those engaged in such enterprises, as when John Dominic Crossan (one of our finer scholars in this regard) nonetheless writes anachronistically of Jesus “waging a frontal assault on Roman commercialism,” “opposing,” for example, “the dislocation of peasant life caused by the Roman building boom in Galilee.” Other and not unrelated revisionist portraits of late describe Jesus as a Cynic sage, a Palestinian revolutionary, an apocalyptic prophet (at least this description has historical pedigree), a mystic, and so forth and so so. The Gospel stories suggest there are some “truths” in these portraits, however partial and obscure, not unlike the truths contained in referring to Jesus as a preacher, a healer, an exorcist, a miracle worker, a radical Jew…. That so many of us read into Jesus our own hopes, wishes, desires, fears and anxieties does not mean that all such readings are equally compelling or valuable, objective or truthful. An aspiration to objectivity and truth, however elusive and fallible (i.e., subject to correction, elaboration, etc. ), remains urgent and important. I’ll cite one illustrious example to reconstruct what Jesus said and meant in the Gospels to demonstrate what I have in mind by way of setting constraints on the various portraits of Jesus: Anna Wierzbicka’s What Did Jesus Mean? (Oxford, UK: Oxford University Press, 2001). Wierzbicka, like many biblical scholars who put a premium on truth, proffers a sophisticated argument by way of explaining the parables, the Sermon on the Mount, sundry sayings, and the Golden Rule. This, and similar works of this sort, should be requisite reading for anyone making claims about what Jesus was up to, a touchstone that sets the parameters for reasoned and reasonable discourse about what Jesus “meant.” Reimagining will no doubt continue unabated without concern for accuracy or truth, but I think that’s unfortunate and thus those of us who care about historical, theological, philosophical and other kinds of truth should remain committed to its pursuit, even if such truth be partial, relative and fallible: it should not be the case that, as we say, anything goes. By all means, let’s discuss the various historical and cultural narratives, but desiderata having to do with objectivity, accuracy, and truth can and should have a role to play at some point in our discussions. Excellent points Patrick. On a deeper, mystical plane, the truth of Jesus of Nazareth’s life and existence does matter. Perhaps what I should have said was that for the historically time bound culture, it often doesn’t.